For nearly 50 years there has been warehousing, coopering, blending and bottling facilities on the 31-acre site of Diageo at Blythswood near Renfrew. One of the perks of working for Diageo (also for contractors:) is the existence off staff shops and Amos Beech just completed the design and the fit out. In line with the staff shop we fitted out in Elgin we redesigned and refurbished the shop in Renfrew, this time with a local touch. 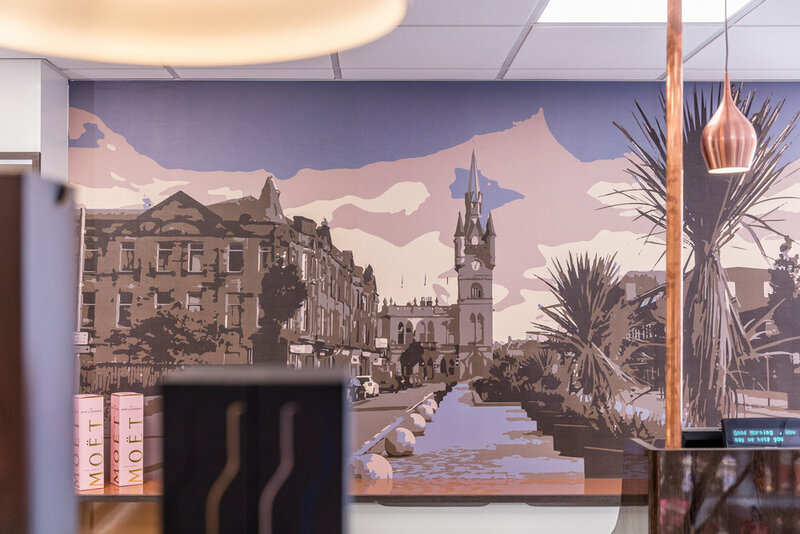 An image of Renfrew town centre taken by one of Diageo's members of staff was edited by interior designer Flora Hogg into nice graphics behind the counter. A much more pleasant environment for the staff to work and to shop!